The Eleventh Karmapa, Yeshe Dorje, was born in the year 1676 to a devoted Buddhist family in the Treschöd region of East Tibet. This district, also known as Golok, had already seen the noble births of the First, Seventh, and Ninth Karmapa. Goshir Gyaltsap Norbu Zangpo Rinpoche and Shamarpa Yeshe Nyingpo recognised Yeshe Dorje as the true manifestation and embodiment of the previous Gyalwa Karmapa Chöying Dorje, following the instruction letter he had left behind. 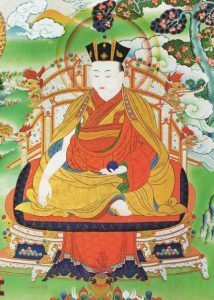 The Shamarpa took Yeshe Dorje to his monastery, Yangpachen, and then to Tsurphu, the main seat of all Karmapas, where he performed the Black Vajra Crown Ceremony, enthroning him as the Eleventh Gyalwa Karmapa. He then imparted the entire Mahamudra lineage transmissions and teachings to Yeshe Dorje. According to a prophecy by Padmasambhava, the Eleventh Karmapa would become a lineage holder of the terma teachings. This prophecy was fulfilled when Yeshe Dorje received transmission of the Nyingma terma teachings from Tertöns Yongey Mingyur Dorje and Taksham Nüden Dorje. In this way, the Eleventh Karmapa blended both the Kagyu and Nyingma teachings. He found and recognised the Eighth Shamarpa, making him the next Kagyu lineage holder. His other close disciples were Karma Döndrub Nyingpo and Karma Tenpa Dargye. Yeshe Dorje was a great visionary and performed many miracles. Unfortunately, his life was to be the shortest of all Gyalwa Karmapas. He passed into Parinirvana in the year 1702, leaving a detailed letter concerning his next incarnation with Shamar Chökyi Döndrub. He was only twenty-seven years old.